The Almohad Dynasty (From Arabic الموحدون al-Muwahhidun, i.e., "the monotheists" or "the Unitarians"), was a Berber, Muslim dynasty that was founded in the 12th century, which conquered all of northern Africa as far as Libya , together with Al-Andalus (Moorish Iberia ). Between 1130 and his death in 1163, Abd al-Mu'min al-Kumi, the only one Berber from Nedroma among the Masmudas and other berber tribes of modern Morocco army, defeated the ruling Almoravids and extended his power over all northern Africa as far as Libya , becoming Emir of Marrakesh in 1149. Al-Andalus , Moorish Iberia, followed the fate of Africa, and in 1170 the Almohads transferred their capital to Seville . However, by 1212 Muhammad III, "al-Nasir" (1199–1214) was defeated by an alliance of the four Christian princes of Castile, Aragón, Navarre and Portugal, at the Battle of Las Navas de Tolosa in the Sierra Morena. The battle destroyed Almohad dominance. Nearly all of the Moorish dominions in Iberia were lost soon after, with the great Moorish cities of Córdoba and Seville falling to the Christians in 1236 and 1248 respectively. Today the holy place and the tomb of the Almohads are present in Morocco, as the tomb of their rivals and enemies the Almoravids. 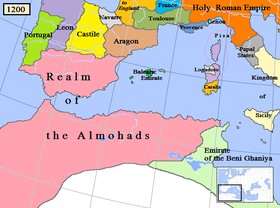 Near East in AD 1200, showing the Almohad Empire and its neighbors. The dynasty originated with Ibn Tumart, a member of the Masmuda, a Berber tribe of the Atlas Mountains of Morocco. Ibn Tumart was the son of a lamplighter in a mosque and had been noted for his piety from his youth; he was small, and misshapen and lived the life of a devotee-beggar. As a youth he performed the hajj to Mecca (or "Makkah"), whence he was expelled on account of his severe strictures on the laxity of others, and thence wandered to Baghdad, where he attached himself to the school of the orthodox doctor al-Ash'ari. But he made a system of his own by combining the teaching of his master with parts of the doctrines of others, and with mysticism imbibed from the great teacher Ghazali. His main principle was a strict Unitarianism which denied the independent existence of the attributes of God, as being incompatible with his unity, and therefore a polytheistic idea. Ibn Tumart in fact represented a revolt against what he perceived as anthropomorphism in the Muslim orthodoxy. Almohad dynasty and surrounding states, c.
After his return to Magreb at the age of twenty-eight, Ibn Tumart began preaching and agitating, heading riotous attacks on wine-shops and on other manifestations of laxity. He even went so far as to assault the sister of the Almoravid (Murabit) amir `Ali III, in the streets of Fez , because she was going about unveiled after the manner of Berber women. `Ali III allowed him to escape unpunished. Ibn Tumart, who had been driven from several other towns for exhibitions of reforming zeal, now took refuge among his own people, the Masmuda, in the Atlas. It is highly probable that his influence would not have outlived him, if he had not found a lieutenant in Abd al-Mu'min al-Kumi, another Berber, from Algeria , who was undoubtedly a soldier and statesman of a high order. When Ibn Tumart died in 1128 at the monastery or ribat which he had founded in the Atlas at Tinmel , after suffering a severe defeat by the Almoravids, Abd al-Mu'min kept his death secret for two years, till his own influence was established. He then came forward as the lieutenant of the Mahdi Ibn Tumart. Between 1130 and his death in 1163, `Abd-el-Mumin not only rooted out the Murabits, but extended his power over all northern Africa as far as Egypt , becoming amir of Marrakesh in 1149. Al-Andalus followed the fate of Africa, and in 1170 the Almohads transferred their capital to Seville , a step followed by the founding of the great mosque (now superseded by the cathedral), the tower of which, the Giralda , they erected in 1184 to mark the accession of Abu Yusuf Ya'qub al-Mansur. From the time of Yusuf II, however, they governed their co-religionists in Iberia and Central North Africa through lieutenants, their dominions outside Morocco being treated as provinces. When their amirs crossed the Straits it was to lead a jihad against the Christians and to return to their capital, Marrakesh . The Almohad princes had a longer and a more distinguished career than the Murabits (or Almoravids). Yusuf II or Abu Yaqub Yusuf (1163–1184), and Ya'qub I or Yaqub al-Mansur (1184-1199), the successors of Abd al-Mumin, were both able men. Initially their government drove many Jewish and Christian subjects to take refuge in the growing Christian states of Portugal, Castile and Aragon. But in the end they became less fanatical than the Almoravids, and Ya'qub al-Mansur was a highly accomplished man, who wrote a good Arabic style and who protected the philosopher Averroes. His title of al-Mansur, "The Victorious," was earned by the defeat he inflicted on Alfonso VIII of Castile in the Battle of Alarcos (1195). In 1212 Muhammad III, "al-Nasir" (1199–1214), the successor of al-Mansur, after an initially successful advance north, was defeated by an alliance of the four Christian princes of Castile, Aragón , Kingdom of Navarre and Portugal , at the Battle of Las Navas de Tolosa in the Sierra Morena. The battle destroyed Almohad dominance. Nearly all of the Moorish dominions in Iberia were lost soon after, with the great Moorish cities of Córdoba and Seville falling to the Christians in 1236 and 1248 respectively. All that remained, thereafter, was the Moorish state of Granada , which after an internal Muslim revolt, survived as a tributary state of the Christian kingdoms on Iberia's southern periphery. The Nasrid dynasty or Banu Nazari ( ) rose to power there after the defeat of the Almohads dynasty in 1212. Twenty different Muslim kings ruled Granada from the founding of the dynasty in 1232 by Muhammed I ibn Nasr until January 2, 1492, when Sultan Boabdil surrendered to the Christian Spanish kingdom. Today, the most visible evidence of the Nasrids is the Alhambra palace complex built under their rule. Map showing the area of Almohad control in Spain and the paths of counter-attacks from Castile (C) and Aragón (A). In their African holdings, the Almohads encouraged the establishment of Christians even in Fez , and after the Battle of Las Navas de Tolosa they occasionally entered into alliances with the kings of Castile. They were successful in expelling the garrisons placed in some of the coast towns by the Norman kings of Sicily. The history of their decline differs from that of the Almoravids, whom they had displaced. They were not assailed by a great religious movement, but lost territories, piecemeal, by the revolt of tribes and districts. Their most effective enemies were the Beni Marin (Marinids) who founded the next dynasty. The last representative of the line, Idris II, "El Wathiq"' was reduced to the possession of Marrakesh , where he was murdered by a slave in 1269. The Almohads, who had taken control of the Almoravids' Maghribi and Andalusian territories by 1147, far surpassed the Almoravids in fundamentalist outlook, and they treated the dhimmis (non-Muslims) harshly. Faced with the choice of either death or conversion, most Jews and Christians emigrated. A few, like the family of Maimonides, eventually fled east to more tolerant Muslim lands, while most of them went northward to settle in the growing Christian kingdoms. Islamic world. (2007). In Encyclopædia Britannica. Retrieved September 2, 2007, from Encyclopædia Britannica Online. Frank and Leaman, 2003, p. 137-138.